Going through menopause causes your metabolism to slow down, so even if you eat the same diet you ate before menopause, you might gain weight. Hormonal changes that go along with menopause can also make you more likely to gain weight around your stomach instead of your hips and thighs. Switching to a lower-calorie diet that includes foods to ease the symptoms of menopause can help you lose weight and feel better. Reduce your calorie intake. You may need 200 fewer calories per day to maintain your current weight than you needed before menopause.That means to lose weight during menopause, you will have to reduce your calorie intake by more than 200 calories each day. To cut the extra calories from your pre-menopause diet, focus on eating smaller portions and swapping calorie-dense foods and beverages for whole grains, fresh fruits and vegetables, and low-calorie drinks such as water, black coffee or tea. Avoid snacking between meals, but if you are hungry, choose whole fruits or vegetables such as an apple or carrot sticks. 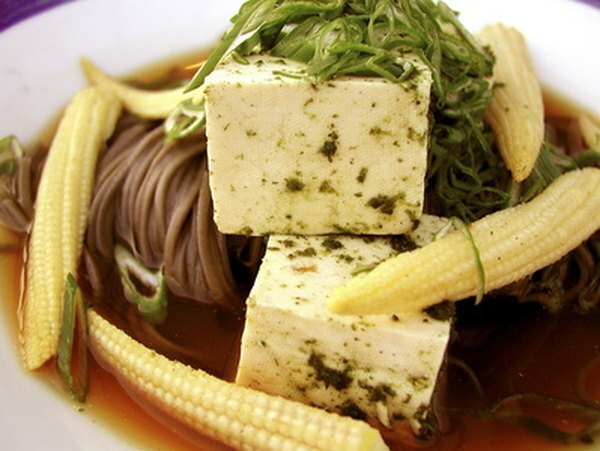 Include soy-based foods, such as tofu, in your diet. According to the University of Maryland Medical Center, some evidence suggests that soy-based foods can reduce symptoms of menopause, such as hot flashes. Tofu is also a good, low-calorie choice for protein and will fit well within your reduced-calorie diet. Try marinating the tofu for a few hours before adding it to a vegetable stir-fry for a boost in flavor without added calories or fat. Increase your calcium and vitamin D intake. Loss of bone density can occur during menopause, putting you at risk for osteoporosis and other health complications. To avoid bone loss, include foods such as spinach, low-fat or fat-free milk and other dairy products, almonds and dried beans. Keep track of your diet with a food journal or weekly menu plan. It might be difficult to gauge how many calories you are eating, or plan healthy meals ahead of time, when you’re not used to this kind of lifestyle. For the first few weeks, try counting the calories you eat by writing them down in a food journal. Once you’re more familiar with what meals and snacks fit into your calorie limits, you will be able to estimate or count in your head. You can also try planning your meals for the week by preparing a menu of healthy meals before you go grocery shopping. That way, you know you have all the ingredients for healthy and nutritious meals, and you can avoid buying high-calorie snack foods on an impulse at the store. ShareCare: How Can I Lose Weight During Menopause?